Manager Narl King has taken on the challenge of a lifetime. From being unemployed to being hired for 2nd division Bersdorf-Condorf, he hopes to take them to the height of Luxembourg football, eventually getting into the Champions League through division winners and in the meantime, hunting for bargains, improving the club's finances, and making strides for the reputation of football in Luxembourg. 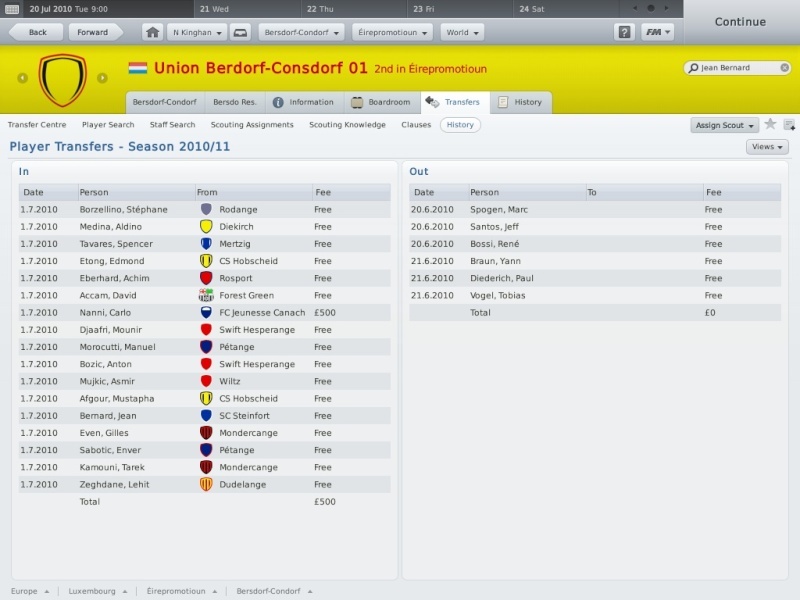 When King arrived, the squad status of Bersdorf-Condorf or (B-C) was abysmal; Only 2 first team players were signed for the club, the rest being un-contracted free agents. King set about bringing in experienced older players, and the squad is now rife with talent, mostly coming from 30-40 year olds, but these players still have a few years in them, and the intent was to get a squad to play with. 17 transfers have been made, with maybe a couple more in the balance, but blending the squad is now King's main aim in the friendlies before the season starts proper. King hopes to start his debut in managerial football with a bang, and as his journey progresses I will update you on the state of affairs at Berdorf-Consdorf. Excellent start Narl - I'm looking forward to seeing more of this. 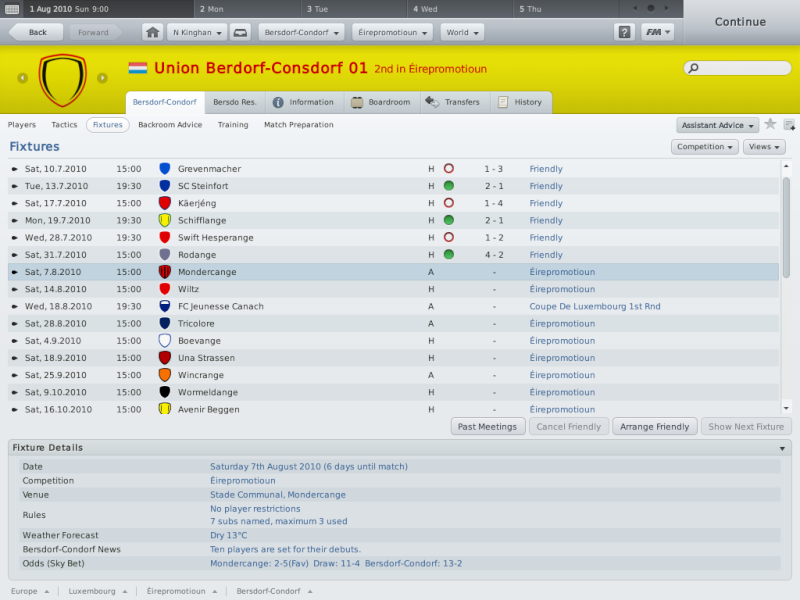 Well, the season is finally about to kick-off with Bersdorf-Condorf winning half of their pre-season friendlies. King is pleased with a 50% winning rate as all the games were played against stronger opposition. He hopes that the pre-season blending of the team, and the performances combined will be a strong stepping stone for the team's first league game against Mondercange away. After 3 competitive games so far this season, King and the club as a whole are already over the moon! A disappointing 2-1 loss away from home started off the season, but King knew this was only a blip in the team's progression. 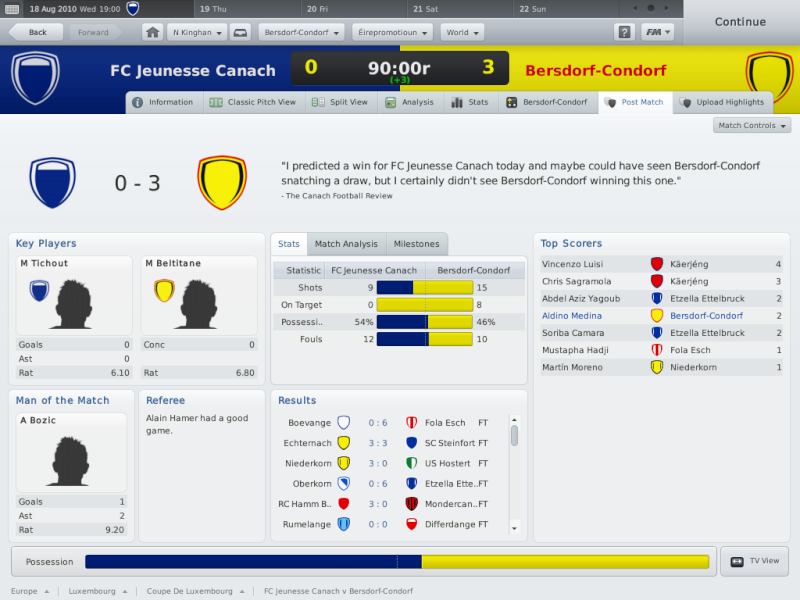 2 successive 3-0 wins followed the loss, one at home to Wiltz in the league, and another, an impressive performance against FC Jeunesse Canach away from home in the Coup de Luxembourg. This result was particularly satisfying as FCJC are in the top division in Luxembourg, a massive gap in class compared to 2nd division Bersdorf-Condorf. A truly great day for the club as we progress to the 2nd round to face Rumelange away, another top division opposition clash. King is now looking ahead to a run of league matches before the 2nd round, and hopes to bring you good news in further updates. Good progress Narly mate - can't wait to see what else the season has in store for you. 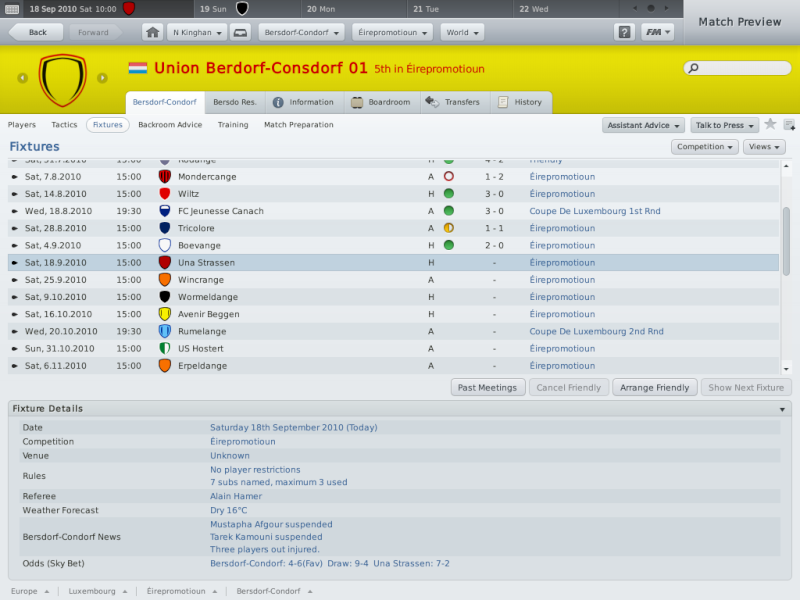 The preparation for the 2nd round was going well, with 5 games unbeaten, 2 wins and 3 draws. 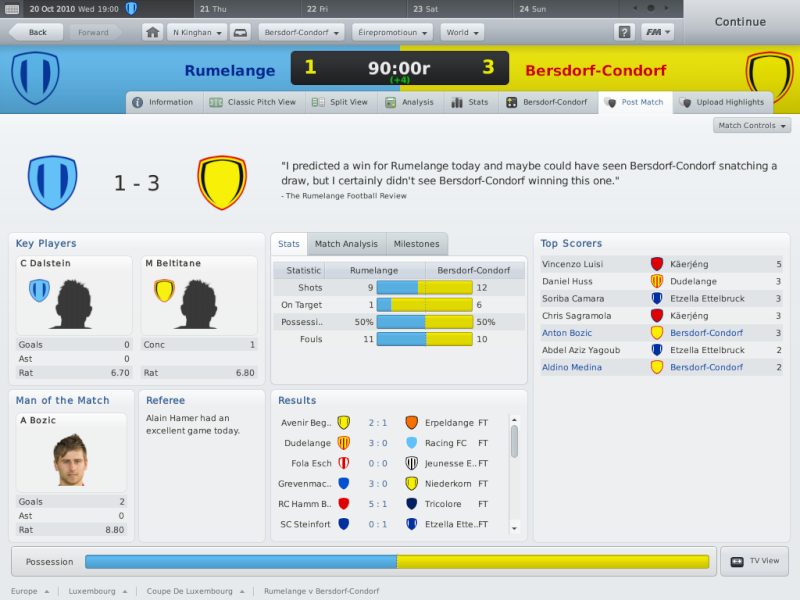 But the team suffered a setback the match before the 2nd round, a 5-2 loss at home to Avenir Beggen. Hopefully the team can turn it around for the cup. 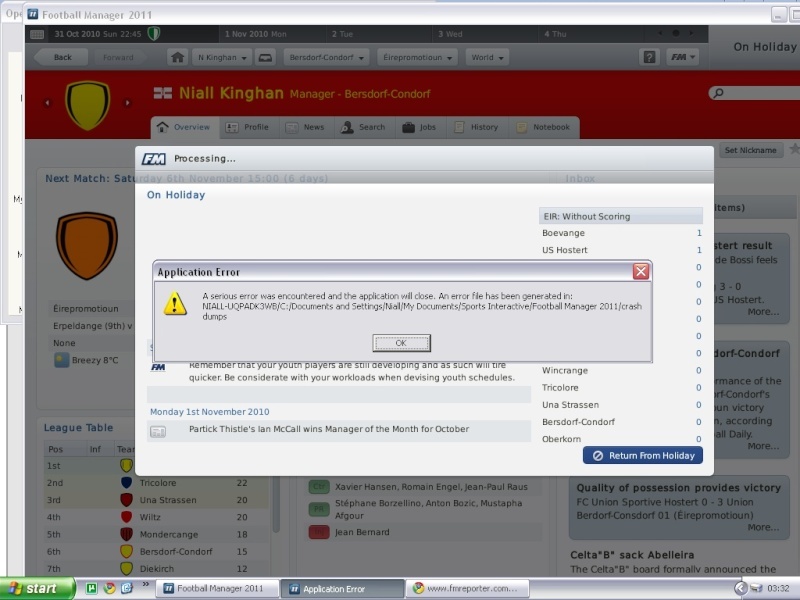 I've won my next game away 3-0 in the league, but soon as I get to 1st November 2010 and try to "continue"... the game crash dumps, won't do anything else, any ideas anyone? Unlucky mate, it may still be saveable though, have you applied the new hotfix to FM? Well, it's time to kick-start this adventure back into life. 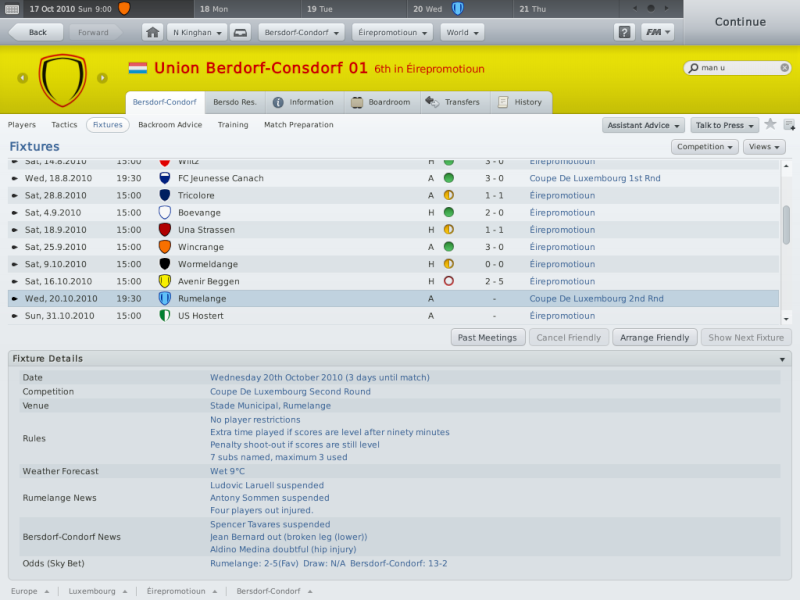 King is delighted to report to you that the challenge has now started again at Berdorf-Consdorf. I'll update you when we've played the 2nd round of the cup and HOPEFULLY, Berdorf-Consdorf can do a repeat of their previous results in this save. Well, the dream's over lads. 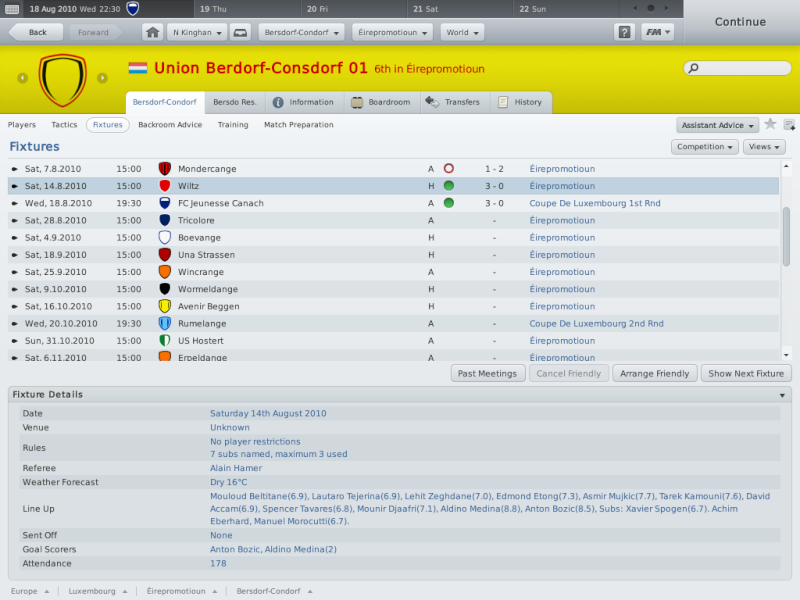 Won every game apart from drawing against Avenir at home. Right before the cup match, it will not let me pass. Crash dump every time. I'm sorry to bring you this news, and I may have a little tear shed later for this game gone bad. I've made an unemployment challenge, which I will make a new storybook about, and will post in this thread when I have made a new game as Berdorf-Consdorf. Good , glad to hear it!